The Centrality project is the type of organization which is aimed at providing with leading innovations with the goal to create a virtual marketplace. The technology featured in Centrality aims to enable consumers to manage their everyday tasks and peer-to-peer transactions with only a single login empowered by blockchain infrastructure. 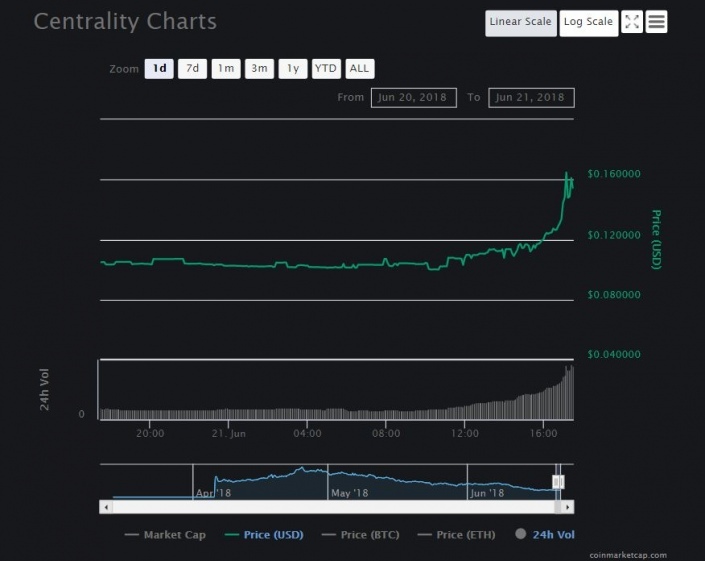 With a total circulating supply of 788,351,962 CENNZ, Centrality has seen over 47.52% price increase for the past 24 hours with a daily volume of almost $300,000, which when compared to it’s overall best is three times lower. But in average, this sudden interest of the token has resulted in an overall spike of it’s price and this trend is likely to continue. CENNZ Token – How Does It Work and What Is It’s Mission? Centrality, which is an Auckland-based entity has been able to raise about $80 million in virtual money during it’s ICO, which in blockchain terms is a tremendous success. The company however, has listed only 16 applications that it’s working on their marketplace. This is completely fine, but most of those applicatios only have a description that they can theoretically work without any proof of real progress. The applications are described as the first payment platform which connects customers to retailers and eliminates the middle man via smart contracts, which is hardly a new idea. And without proof, it is still hard to understand how credible is their project. Another issue when it comes to Centrality is that it’s token is not listed on so many big exchanges, despite that they have been around for quite some time. And not only this, but the Centrality token has not seen any major announcements lately which does raise some eybrows. But when we think about the CENNZ token and it’s utilization, it can quickly become clear that it is a native type of token, used to link customer data to different processes, according to their white paper. If this type of method is actually demonstrated to work,the modules and applications of Centrality token can be able to create various different transactions on their own which is a completely new ecosystem. So if the CENNZ token is implemented successfully, we can see a potential of the company succeeding in the long-run, since they now do have the financial as well as the human power elements to do that. And if they reach the goals that are set in their white paper and present them to an actual solution that works, they can turn their idea into a reality. This site has really lost its way. You dont know who you are. You are talking bitcoin yet name is hotstocked. you are confused.